More often, on the days we are given off following a long tour, you will find THIS INTROVERT hiding away in my home far from the world, recovering. Typically on tour, it is hard to get time alone. Interacting with people around the clock is just what we do. When we are not on stage performing, a good bit of our time is spent fellowshipping with our host families or pouring out and doing ministry. Another good bit of time is spent with my cohorts, whether it's bonding for hours on end on the road in our little white vans, or sightseeing and exploring together. I love my job, my friends, and the people we meet on tour, BUT there is something so nice and special about those first couple of days back from tour, when I FINALLY get to pull away and spend some time to myself which is a real treat for an introvert. Usually, I just hang around the house, I catch up on some "R and R", and tackle some of the household chores that are abandoned during my time away. But today is different. Today I spent time with my dear friend Emma. She is the best! HERE IS WHY. For Emma, I never mind sacrificing a bit of my time set aside for being introverted. I just love spending time with her! Emma is a fellow company member of mine at Ballet Magnificat as well as the current company seamstress. 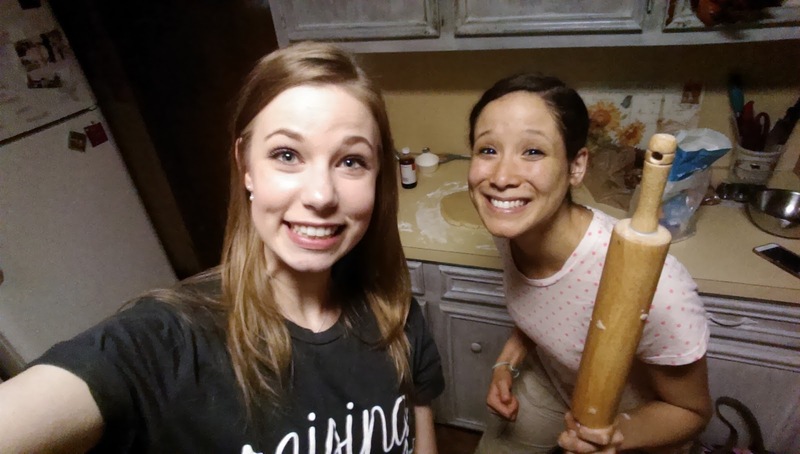 At the beginning of last year, I made a deal with Emma jokingly that if over the course of the whole season I didn't break any of my costume hangers (I really don't know why I'm so good at breaking them), then my reward would be to have a cookie baking session with her. 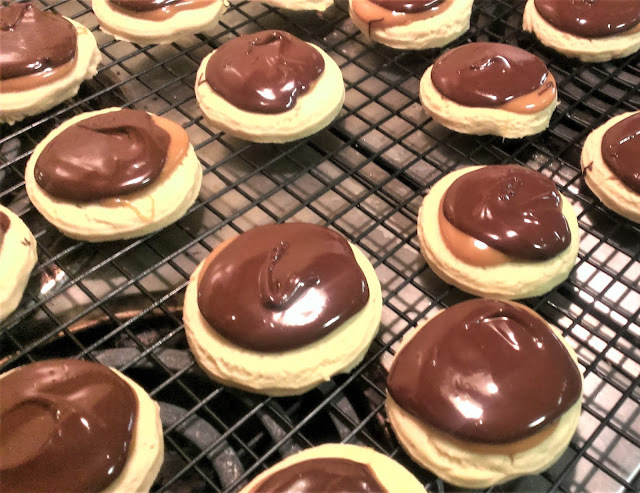 Well, I successfully went through the whole season without breaking any of my hangers and the cookie recipe that I'm going to share with you in this blog post today is what Emma and I decided to make today as a reward for my accomplishment. I came across this recipe while surfing on Pinterest one evening. I'm so glad we chose to make this recipe. 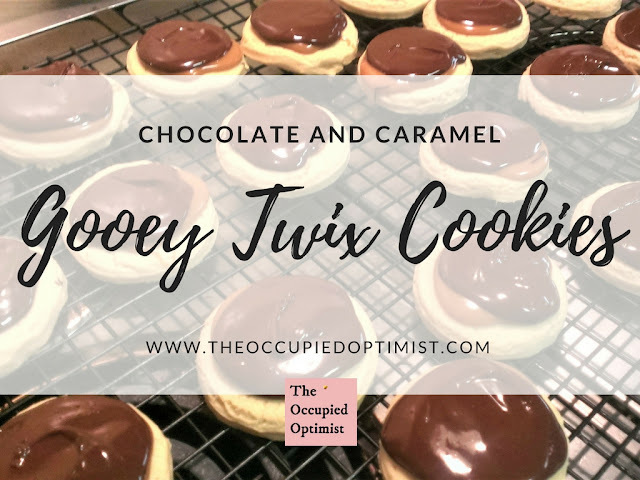 These cookies are easy to make and a perfect fall treat! We had so much fun making them and I hope you do too! Mix butter and sugar together. Then add vanilla, flour, and salt. When your mixture reaches a nice creamy doughy consistency, roll it out to a 1/2 inch thick. lightly flour the surface you intend to roll your dough out on to prevent the dough from sticking. Next, use a glass or small circular container to cut out cookies, about 2 inches wide. Place cookies on a lightly greased cookie sheet. Bake cookies at 350 degrees for 14-16 minutes. Melt caramel in a bowl and then spread evenly on each cookie. In another bowl add shortening to your milk chocolate chips and melt them in the microwave. Keep your eye on it to be sure that it doesn't burn. 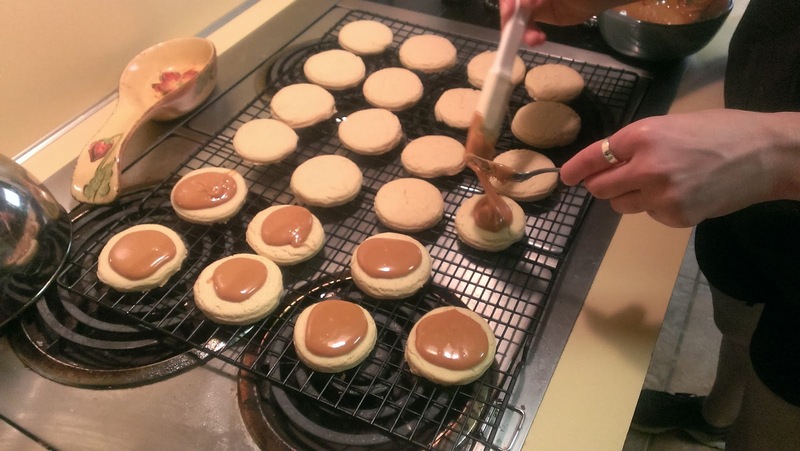 Then, spread evenly on top of caramel of each cookie.